In our daily lives, many of us will see a building that sparks our interest, whether it is because of intricate details or the local history. Associations of familiarity, for what once was, and what could be for a building, act as a catalyst for those who are motivated to take on these types of projects. For Melanie and her husband, Marty, these reasons were, and still are inherent for why they have taken on this building at risk. 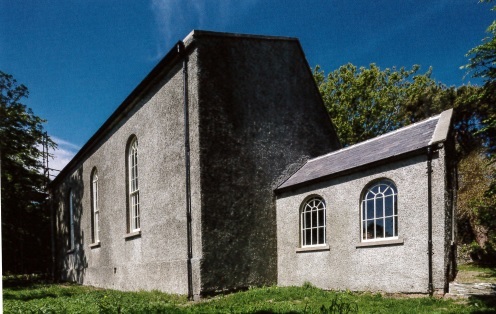 The building in question is Strangford Presbyterian Church dating from c. 1840. The building has a striking and unusual stucco façade of considerable merit, with six pilasters (four paired), three rounded-headed recesses and a triangular pediment supporting a curious small obelisk. The Church has been on the ‘At Risk’ register since 2003, for the reason that typically and particularly affects Churches; a lack of numbers in the congregation which led to the closing of its doors where the church had then lain vacant for many years. Being locals to the area and watching the ever-increasing deterioration of the building Melanie and Marty decided to approach the previous owner in 2016. Speaking with Melanie, she said, “The acquisition of the Church took some time, involving discussions with the previous owner who had originally bought it with plans to develop but did not proceed, meanwhile the building had gradually deteriorated over many years.” The determination of Melanie and Marty to prevent the Church from falling into a state of disrepair has now evidently rescued the Church. Having had the assistance from the Department for Communities: Historic Environment Division’s Historic Environment Fund and greatly investing themselves, the couple decided to prioritise repair works to address as a matter of urgency the deterioration of the roof due to lost slates, missing rainwater goods and failing windows, thus fulfilling the pressing need to get the building water tight. Regarding the repair strategy for the building, Melanie said, “This first phase involved the replacement of like-for-like materials and the renewal of the existing structure…A lot of research was carried out at each different stage of the repairs, to ensure that the correct materials and traditional methods were used.” The strategic phasing of the works has staved off further decay and deterioration, allowing time for the new future of the building to be visualised and developed. While the project is still a work in progress and not yet complete, the benefits and stability these repair works have delivered will be key to a sustainable future for the Church. The heritage-led approach to the repair by Melanie and Marty means that the village of Strangford will retain a very visible and tangible piece of its heritage for future generations to admire. Regarding the future of the building, the couple have said, “We are very excited to continue on the journey of bringing this beautiful old building back to life!” The sensitive approach to the Church space and form by the couple will provide a new lease of life and a building for its owners and the community to cherish.